Leading storage and materials handling specialist, Dexion offers a range of locker solutions designed specifically for activity-based workplaces. Activity-based workplaces or ABWs are trending in global work environments, where many employees perform their work in an office without having a fixed desk. While the philosophy underpinning this model is that at any given time, only 70-80% of the available workspace in an office is being utilised for reasons such as staff being on holiday, sick or away on business, businesses grapple with the issue of ensuring that the personal belongings of such floating employees are conveniently, safely and securely stored. Dexion has worked with a host of corporate and government employers to deliver state-of-the-art hard-body locker solutions for ABWs. According to Dexion’s National Sales Manager, Michael Cumner, there has been a significant spike in demand for ABW lockers recently. Cumner explains employees are becoming increasingly mobile thanks to technology advancements, which allow them to work from home, on the road or locations away from their regular desk. 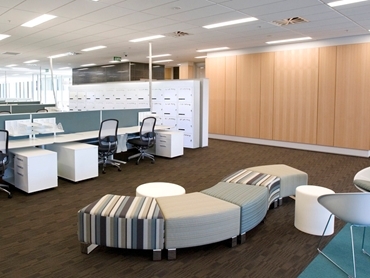 Large companies such as Macquarie Bank, Google and Commonwealth Bank have all converted to the ABW model, creating workspaces that facilitate the varied tasks undertaken by its employees. The ABW concept offers several benefits, including significant cost savings due to catering for only 70% or 80% of total staff, reducing the actual need for office space; reduced carbon footprint from lower energy consumption; and increased flexibility for employees in terms of having the freedom to work in environments that are most suited to the task at hand. The potential result is improved productivity and collaboration that comes with employee empowerment. However, the modern ABW is not without its challenges as businesses and architects must satisfy a raft of logistical requirements in order to effectively cater for mobile staff including a secure facility to store their personal items and documents. Key requirements for these storage lockers include secure storage; integration with intelligent software that allows for multiple users; extremely space efficient footprint but large enough to secure laptops, documents and other belongings; and user friendliness and convenience, especially for workplaces with high staff numbers. Dexion has designed their ABW lockers to meet the evolving demands of users, incorporating both internal and external elements to the lockers for robustness, safety and security. Space optimisation being at the core of ABW, Dexion’s lockers are designed to maximise internal capacity while occupying the least possible amount of floor space. Lockers are available in a variety of sizes to ensure complete versatility. Given that many businesses already utilise smart cards for building entry, printer use, meeting room bookings etc., Dexion’s lockers are easily configured to suit a range of software systems. Control of the intelligent locking system can be through hard-wired, 3G or freestanding battery operated locks. For the hard-wired and 3G systems, employers have access to a software system that details the history of their staff’s locker use.